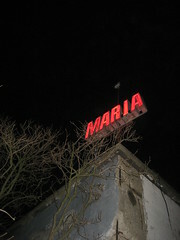 Club Maria is one of the best places to see live Electro acts in the city. The club consists of two separate halls in an old industrial building. Located near Ostbahnhof, the area around the club is a little bit run down, but the club itself is well appointed. Drink prices here are reasonable and a bit under the Berlin average and the door policy is pretty relaxed. Live acts play almost every Friday and Saturday night, and sometimes during the week. Be the first to write a review about the Club Maria! See below for more information. Have you already visited the Club Maria? If so, let everyone know what you thought about it by writing a review! No registration necessary. Just click here to start writing!